Accelerate Weight Loss and Cellulite Reduction in 10 Minutes! What Does Whole Body Vibration Do? Whole Body Vibration (WBV) offers a low-impacts way to increase strength, flexibility, and rejuvenate your body – in addition to increasing metabolism. WBV causes the muscles to experience an involuntary contraction at the same rate that the platform is vibrating. The mechanical stimulus produces a stretch reflex in 100% of your muscles. This means your muscles react to the vibration by contracting and relaxing automatically (like when the doctor hits your knee with a little hammer). How Did WBV Come About? It’s a noninvasive workout that you don’t have to change into workout clothes for! It’s also a multifaceted tool that complements aerobics and strength training. It’s simply a great tool for a healthy lifestyle! Accelerated Weight Loss: WBV stimulates all cells in your body to function at a higher rate, which in turn increases your metabolism causing more fuel to burn; therefore, accelerating weight loss. Reduces Cellulite: WBV causes increased local circulation to all areas of your body, in turn giving visible cellulite areas a “smoother” look.Reduces Varicose Veins: WBV causes increased lymph drainage, which lowers the pressure in varicose veins so the valves of the veins can close off. Improves Muscle Strength: WBV improves muscle strength the same way regular exercise does. Vibrations lengthen and shorten the fibers depending on the frequency. Enhances Wellness: WBV increases blood flow, lymph drainage, oxygenated cells, the release of endorphins, and detoxification of the body. Enhances Detoxification: WBV works from the inside out – waste products are expelled at a cellular, lymphatic and excretion level. 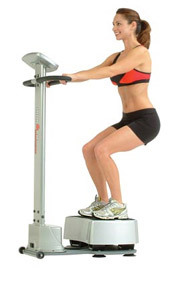 Improves Circulation: WBV improves circulation through increased blood flow by stimulating your exercise heart rate. Improves Relaxation: WBV increases circulation, blood flow and oxygen intake. WBV also reduces cortisol (the stress hormone) and creates and releases endorphins. It also detoxifies your body, enhancing relaxation.